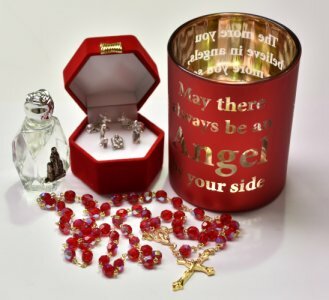 CATHOLIC GIFT SHOP LTD - Christmas Candle Gift Set with Lourdes Water. Christmas Candle Gift Set with Lourdes Water. > Hexagonal bottle containing Lourdes water with a picture on the front depicting St Bernadette kneeling to Our Lady of Lourdes. Bottles measure approx. 6.5 cm tall.